Some weeks back, we featured a turntable platter mat in our news section that promises to significantly enhance vinyl playback. The Dereneville Magic Mat is made in Germany and has found a ready following among vinyl enthusiasts in Europe. The Magic Mat’s makers claim that it addresses micro-resonances by ensuring an ideal marriage between the LP record and the turntable’s platter. It’s also meant to offer anti-static properties, and even removes dust on the record surface. Local importer/distributor Lowveld Audio sent me a sample for review. 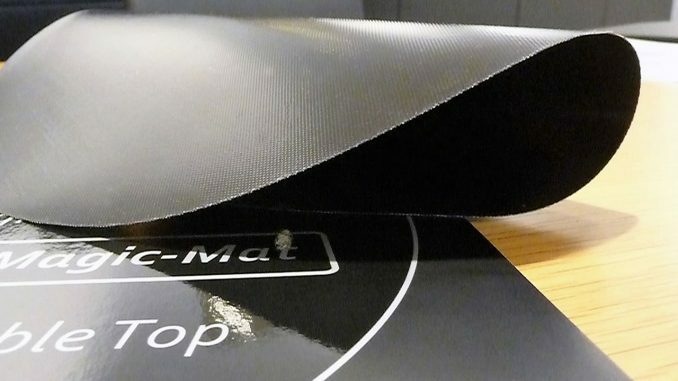 It’s packaged in an LP record-sized sleeve, and looks fairly innocuous: it’s paper-thin and slightly sticky, with an all-black finish and a finely woven texture. The mat really is thin: 0,38 mm to be precise, and is constructed of a thin layer of fibreglass, sandwiched between two layers of silicone. Because it’s so thin, the effect of the mat on the tonearm’s vertical tracking angle (VTA) should be minimal – unless, of course, you’re swapping out a thicker platter mat or covering with the Magic Mat. I’ve been spending a fair amount of time with the Magic Mat, swapping it between two different turntables, both in regular use in my reference system. The Avid Diva II SP is a non-suspended turntable fitted with a heavy alloy platter with a bonded cork surface. It’s fitted with an SME 309 tonearm, and I used a Van Den Hul The Frog moving coil cartridge for this review. The other turntable is a heavily modified Linn LP12 equipped with an Ittok LVX tonearm and Lingo outboard power supply. During the Magic Mat review, it was fitted with a Van Den Hul Colibri MC cartridge, while the standard felt mat has been replaced with a Funk Firm Achromat. This LP12 has been fitted with a DewAudio Starmap upgrade kit (review pending). The kit involves fitment of new top and base plates to strengthen the plinth, address resonances and vibration, and provide enhanced grounding. I listened to a vast variety of LPs on both turntables with and without the Magic Mat during the review period, but I’ll use our Record Of The Week – the absorbing In A Silent Way by Miles Davis – for the review comments, as it’s an excellent test record that ably highlights the capabilities of the Magic Mat. To be honest, I didn’t know what to expect of the Magic Mat: was it all hype, or would it really make a difference? Well, after many hours of comparisons and turntable swaps, I’m convinced it makes a significant difference. In general terms, using the Magic Mat results in a more planted, organic sound. Bass notes have more body and gain presence, but there’s also a sense of improved definition and a more natural flow and impetus. In A Silent Way is a taxing performance for any system, mainly because the production is filled to the brim with the contributions of Davis and his seven-piece all-star band. In fact, it’s the band that commands the spotlight most of the time, with the genius trumpeter only occasionally making his imperious appearance to take ownership of the set. The music’s freeform approach sees Herbie Hancock and Chick Corea on electric pianos duke it out with the keyboards and organ of Josef Zawinul, all crowded into the left side of the sound picture, with drummer Tony Williams and the upright bass of Dave Holland also in that space. Dominating the right channel is John McLaughlin’s soulfully eloquent electric guitar, joined by the equally adept tenor sax of Wanye Shorter. Of course, dominating the sound image’s focus point is Davis’ virtuoso trumpet, which deservedly takes the commanding centre stage. It takes a pretty decent system, and especially a talented record deck, to paint the performance’s sound picture accurately. At worst, it becomes a jumble of notes and instruments that blends into an inconclusive whole, much like a non-descript soup. Both my turntables managed to express the dimensional and tonal complexities of the recording believably without the help of the Magic Mat. But it’s also true that the Magic Mat allowed the two decks to make even more of the information encoded in the vinyl’s grooves. While there were differences in the way the Magic Mat interacted with the two turntables, there were significant common trends. Despite the density of the mix, the Magic Mat allowed the various instruments to become more clearly defined. This was true not only with regard to the spacing across the width of soundstage, but also in terms of stage depth and height, allowing a stronger sense of three-dimensionality. Overall resolution was also finer, translating into enhanced definition, so that the individual contributions of the various players could be more clearly recognised and enjoyed. Despite this, one of the most telling benefits offered by the Magic Mat was a more pervasive sense of cohesion and musical purpose. Davis’ sublime trumpet gained body and a certain richness absent before, but never to the point of oversaturation or artifice – it was simply a case of more of the music being brought to the fore. The performance also took on a more layered nature, allowing the interplay between organ and keyboards, for instance, to be defined and enjoyed more succinctly. Furthermore, the enhanced clarity and definition allowed more subtle elements – the draw of the bow over the upright bass’ strings, for instance, as well as the timbre of the percussion, and the texture of Davis’ trumpet, to come to the fore. While these trends were common to both turntables when fitted with the Magic Mat, the more significant gains were achieved with the Linn, where the Magic Mat could be placed directly onto the alloy platter. The results were less obvious when the mat was placed on top of the Achromat, suggesting that the latter already performs a similar role. Similarly, the bonded cork layer on the Avid’s platter seemed to limit the effectiveness of the Magic Mat, although the differences were consistently unequivocal and significant. Ideally, you should try out the Magic Mat before committing to purchasing it – results are likely to vary between turntables, with aspects such as turntable location/isolation also playing a role. The Dereneville Magic Mat has a strong fan base in Europe, and rightly so. Sadly, our weak currency means that it’s not a cheap upgrade, but it’s certainly a worthwhile one for those seeking to optimise their turntable’s performance.